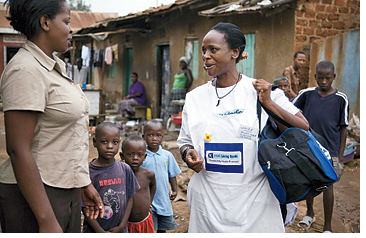 Living Goods replicates Avon’s model of door-to-door selling, but instead of peddling lipstick and mascara to middle-class women, Living Goods’ Health Promoters sell affordable health products–from antibacterial soap to de-worming tablets to condoms to bednets–to the Ugandan poor. By providing a way for women to make a living by selling products that prevent unnecessary death from treatable diseases, Living Goods is fighting the double-headed dragon of mortality and poverty. More than 10 million children die every year (pause for a second; that’s 27,398 deaths a day) from easily treatable conditions like malaria, TB and diarrhoeal disease. Products for prevention and treatment exist, but efficient and scalable delivery systems are lacking. Living Goods uses micro-enterprise and micro-franchising to get these products into communities and to keep them there. Health Promoters buy a business-in-a-box for $100-$250, which includes the products, as well as training, marketing and coaching. Living Goods and its partners–one of whom is the microfinance and development organization BRAC–provide affordable financing for the kits. Child and community health, female economic development, financial sustainability, open-source replication, local support, microfinance micro-enterprise–these outcomes and mechanisms give me an adrenaline jolt. Why have I not heard of Living Goods earlier? If you’re as moved by Living Goods’ approach and mission as I am, you can sign up for its e-newsletter or make a donation. Living Goods doesn’t yet have a Twitter or Facebook presence (but I’m about to offer to help develop it for them). Wow. really liked this story. It seems like a good strategy. I wonder if the Ugandan poor even have discretionary money for such things as bednets. But it is a creative way to educate and to get products out there. It also has potential to engage whole communities in group purchasing, etc. Thanks for reading and leaving a comment, Mary. I’m so glad you asked that question (I should have included this explanation in the post). Living Goods’ target communities, although poor, have some discretionary income to afford low-cost (maybe even subsidized) health products. I’m curious about what the monthly average income is for these communities. Group purchasing is a great strategy! Love the concept behind Living Goods! Selling products at reasonable prices that people need (and can save lives) plus providing economic opportunities for the people selling the products. Thanks for bringing awareness to Living Goods and their work. I will definitely look into them for when we go to Uganda. Would be fascinating to see their work on the ground! I can’t wait to follow your work in Africa!